A recent article in Men’s Journal explored the multiple benefits of fasting. But fasting (abstaining from eating food), for an extended period of time, can have risks and should only be undertaken with proper medical supervision.That’s one of the reasons why Doctor Michael Mosley, creator and author of The Fast Diet, doesn’t advocate total fasting. He does recognize the health benefits—longer life span, cancer resistance, weight loss, cognitive improvements—and has tried extended fasting himself but he says that intermittent fasting (one or two days—24 hour periods—per week without food or with limited food ) can give you all the benefits of fasting without the pain. Dr. Mosley also says that you don’t even have to starve yourself for the entire time to enjoy all the benefits. His research has shown that restricting your calories (typically 600 for men and 500 for women) during two 24-hour “fasting” sessions per week is just as effective and a whole lot easier. That’s the structural basis of his version of the popular 5:2 diet. Pilon also points to increased production of adipose tissue HSL (Hormone Sensitive Lipase) and muscle tissue LPL (Lipoprotein Lipase)—fat-burning enzymes—as positive reinforcement for intermittent fasting as a form of weight loss. Dr. Mosley’s research concurs and also notes that those who fast can also increase their insulin sensitivity. This is good news because insulin essentially helps your body store the sugars you consume as fat. Increasing insulin sensitivity means less insulin is produced and less fat stored. Dr. Mosley found that combating the fear of hunger and the occasional hunger pangs is definitely the hardest part for most folks attempting to use intermittent fasting for weight loss. 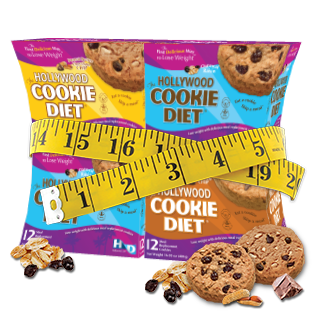 The Hollywood Cookie Diet® blends perfectly with this version of an intermittent fast because each nutritious cookie contains only 120 – 150 calories (depending on the flavor) —so you won’t even come close to breaking your daily caloric limit! What’s more, all flavors of these delicious cookies are loaded with dietary fiber and protein which both help you feel fuller longer. Fewer hunger pangs mean less temptation to cheat! According to Dr. Mosley, another important factor for success is that people following his version of the 5:2 diet are allowed to eat all the foods they love – but only on non-fast days. The Hollywood Cookie Diet® cookies give you the taste sensation of sweet chocolate chips, gooey peanut butter, and wholesome oatmeal at a reasonable caloric level. You get the flavors you crave without busting your fasting day limitations. The science says it all: intermittent fasting can be good for you and help you lose weight. The Hollywood Cookie Diet® can help you fight the temptation and hunger that might make fasting difficult. Combine the two diets to give your unwanted pounds the one-two punch.